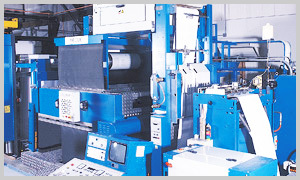 Combining the best of both traditional sheetfed and web presses, the Variquik is truly a unique machine. Designed to run a variety of page sizes and folding options, it has the advantage of printing and folding in one operation. With today's emphasis on 'shorter-runs' and 'faster turnaround times' the Variquik gives us a tremendous advantage over traditional environments. At the heart of the Variquik are two distinct modules. First, the printing module is a unique vertical tower that allows for virtual 'non-stop' printing, by greatly reducing the make-ready and change over times. The folding module supports hundreds of folding configurations allowing us the flexibility to produce the job in the most economical way with a minimal amount of waste.